Synopsis: A scene of bathers on a beach. 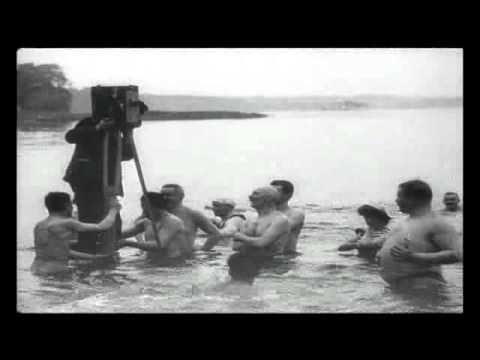 This early German film is classified as a documentary, but given its opening and closing shots, in which we see a small, buffoonish cameraman clowning around, it could also qualify as a comedy. Im Wannseebad is about five minutes long, and sandwiched between these aforementioned shots we see a collection of scenes of bathers on a beach. The majority of them grin at the camera like loons and follow it around like filings attracted to a magnet. It’s difficult to accept – but impossible to deny – that many of those captured in such a carefree mood would, just four years later (although the year of filming is open to debate), be dying in the trenches of WWI. As with so many of these early movies, Im Wannaseebad has more value as a historical and social document than as filmed entertainment.